Tired of the same old potato side dish? 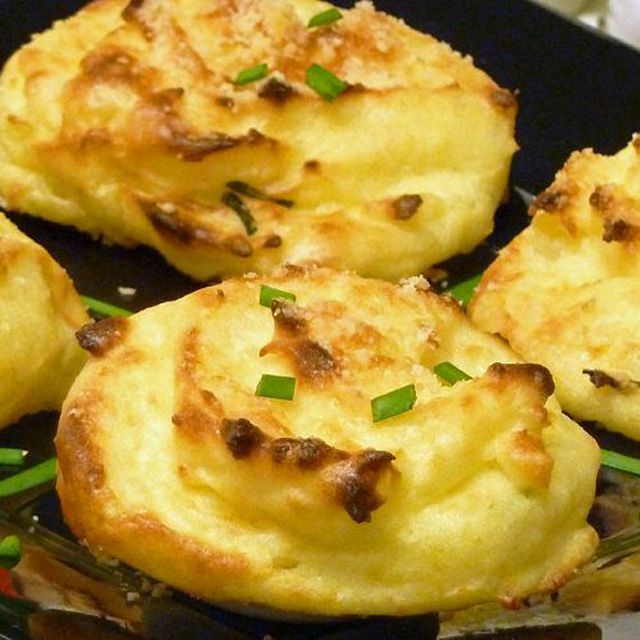 Try these simple mashed potato puffs flavored with Cheddar cheese, chives, and Parmesan. They are quite easy to make and not as heavy as most potato sides. If you are feeling adventurous, try adding some real or imitation soy bacon bits for extra pizzazz. Boil potatoes in salted water until fork tender. Drain thoroughly and return to the pot. Add milk, onion powder, and salt. Mash until no lumps remain. Whisk together flour and baking powder. Add to the mashed potatoes, along with the beaten egg, and whisk until combined. Fold in Cheddar cheese and chives. Preheat oven to 350 F. Line a baking sheet with non-stick foil. Spoon or pipe rounds (about 2 inches in diameter) onto prepared pan. Sprinkle with Parmesan cheese. Bake about 20 minutes until puffed and golden. Let cool for 5 minutes before serving. Blender Method: Place cooked potatoes into the pitcher of a heavy-duty. Add milk, onion powder, salt, egg, and baking powder. Pulse until smooth and combined. Transfer to a bowl and fold in Cheddar cheese and chives. Proceed as above to bake. Blender method tested with Ninja Kitchen System 1200.